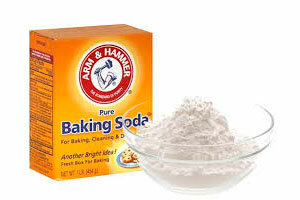 Baking Soda for Acne? Yes, It Really Works. You Can Do So Much More With It Other Than Just Baking! Baking soda is something almost all of us already have around the house, and it can do much more than just enable home baking efforts and keep your refrigerator fresh – it can help combat the effects of your acne. Baking soda is also known as sodium bicarbonate, and it is a highly alkaline substance that can neutralize acids. That’s what makes baking soda for acne work – it’s ability to calm down the pH level of your skin after acne makes it far too acidic. Also, baking soda has anti-inflammatory and anti-bacterial properties that help soothe the effects of acne outbreaks as well as prevent them. And when formed into a paste, it can be used as a face mask that will pull dirt and oils out of clogged up skin pores. That’s the basics on how baking soda helps in the war on acne, but read ahead to delve into more of the details! The active ingredients found in ordinary household baking soda can do wonders for your face and other acne-afflicted parts of your body if you put them to the right use. Acne exfoliant. Simply mix a small amount of baking soda with water and then gently rub it all over your whiteheads, blackheads, and other acne sore spots. Immediately rinse. Spot treatment. Leave the acne paste on acne bumps and pimples for around 20 minutes, but don’t cover your whole face. Facial mask. Make a paste of baking soda and water or any variety of other powerful ingredients (more on that below!) This time cover the whole face, or at least the “T” section that for acne so often afflicts. Wait for 15 to 20 minutes before peeling and rinsing the mask off. Special additive. Many facial cleansers already have sodium bicarbonate on the ingredients list, but some don’t. Adding a half teaspoon of baking soda to your regular facial cleanser or moisturizer, twice a week will help fight acne even as you care for your face. Whenever using baking soda on your face or skin, be sure to rinse off thoroughly 20 minutes after application. It’s best not to leave the baking soda mixture on your skin overnight, despite the advice of some, since it could cause excessive drying of your skin or overdue the beneficial pH effects of baking soda until they’re no longer beneficial. Not only does baking soda have special properties that help you win the “war on acne, ” but there are also numerous natural ingredients that can help fight acne as well. For more information on these natural remedies, click here. To see how they can become part of a “paste” to use against acne on your forehead, nose, cheeks, chin, and all of your face, continue reading. Baking soda acne face masks are simple, affordable, and effective. 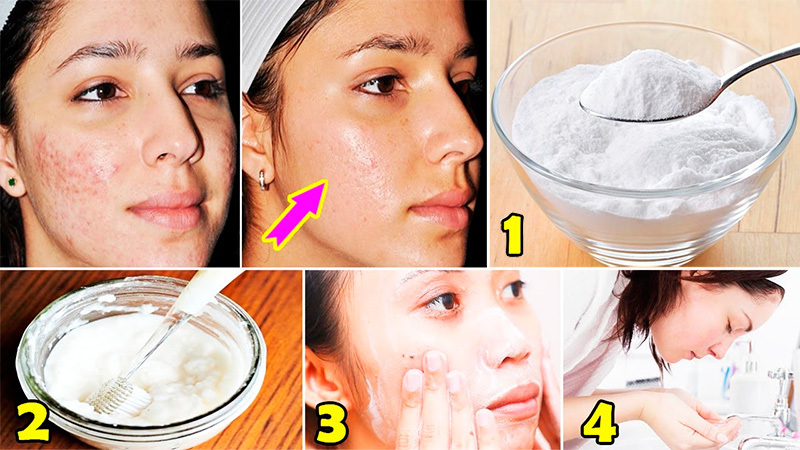 Various natural ingredients can be incorporated into baking soda face masks for acne. We’ll look at some of the different face masks in the next section below, but here let’s look at the basics of how to make any baking soda face mask. Mix 2 tablespoons of fresh baking soda with a small amount of warm water in a bowl. Mix the bowl’s contents with your fingers, adding a drip or two more water as needed, until you have a sticky paste. Don’t let the paste get runny. If it does, add more baking soda and mix again. Take small dabs of the paste into your fingers and massage it all over your face until it forms a solid mask. Wait for 15 to 20 minutes before rinsing the face mask off. Leaving it on for extended periods of time could dry out your skin. And you really shouldn’t apply baking soda to your face more than once or twice a week. Acne afflicts you skin with whiteheads, blackheads, and an assortment of other pimples and protrusions. Skin pores get clogged up with oil, dirt, and festering bacteria colonies. A face mask can help remove these undesirable elements from your face and improve your skin health and the appearance of your face. Why choose baking soda over store bought face masks? Although the ready-made facial masks you can buy in the store in a bottle or packet work well enough, baking soda has two distinct advantages over them: it contains no added chemicals that might harm instead of help your skin and it is much, much less expensive! There are many different recipes you can find online to help counteract the effects of acne with a baking soda based face mask. We will only look at what, arguably, are the top 5 here. But realize that baking soda hydrogen peroxide and tea tree oil are also top contenders that almost made our list of five. And be sure to check out this link to discover how tea tree oil fights acne, with or without baking soda mixed in. One of the simplest masks you can make that is extremely effective on acne is a lemon juice baking soda face mask. All you need is just a fresh lemon and a box of fresh baking soda – don’t use that box that’s been in the back of your fridge for five years! Cut and squeeze a fresh lemon, catching the juice in a bowl. Measure out 1 teaspoon of lemon juice. Combine the lemon juice with 2 teaspoons of baking soda. Expect it to fizzle. That’s natural. Mix it until it’s a runny, pale yellow tone. Apply all over the T zone of your face. Wash off immediately and try a different approach if you feel a burning sensation. Otherwise, wait 15 minutes before rinsing. There are many benefits of using honey, and you can investigate them more fully at the other end of the provided link. Also, note that you can combine a teaspoon of honey with a lemon baking soda mask or with other masks to enhance them. Add 1 teaspoon of raw honey to 1 teaspoon of baking soda. Make sure you get all the honey that’s clinging to the spoon or you won’t have the proper amount of honey in the mix. Mix the honey and baking soda, adding a couple dribbles of water to thin it out a little and make it easier to mix. Rub the paste on your face, exfoliating as you go. Cover your face and rinse it all off in 15 minutes. Honey’s antibacterial and anti-inflammatory powers combine well with baking soda’s pore unclogging abilities. Coconut oil has antibacterial and anti-fungal properties that can benefit your skin without the need to resort to harsh chemicals so often found in store-bought products. Plus, it opens up your pores, moisturizes your skin at a deep level, and helps prevent wrinkles. Combine 1 teaspoon of coconut oil and 1 tablespoon of baking soda. Stir to a paste. Add a tiny bit more coconut oil if the mixture seems too thick and a pinch extra baking soda if it gets too thin. Apply the paste to your face and wait for five minutes. Then massage your face, especially near acne pimples, for a couple minutes. Wait eight more minutes before rinsing the mask off. Number four on our list has three ingredients instead of two because apple cider vinegar is usually combined with not only baking soda but also honey for face masks. Combine 1 teaspoon of 100% organic and pure apple cider vinegar with 1 teaspoon of baking soda and 2 teaspoons of raw honey. Mix well. Use a brush to apply the paste all over your face, avoiding the eyes and lips, however. Wait 15 to 20 minutes before thoroughly washing the mask off your face. Then dry with a towel. We assume you already own a tube of toothpaste, but you probably planned on using it to brush your teeth instead of your blackheads with it! Get a tube of toothpaste, preferably with baking soda already in it and with minty flavor since mint can help too. Squeeze out a teaspoon or two of toothpaste and drop it into a bowl full of 2 tablespoons of baking soda. Mix well. Massage the resultant paste all over your face. Rub gently around blackheads and whiteheads. You can also massage your face with a soft-bristled toothbrush. Wash your face with cool water and pat dry with a towel. Baking soda, as we have seen, can do much to benefit your skin and combat acne when used in the right way and amounts. And, however, baking soda is powerful. Its pH of 9 is a strong alkaline that can counteract an overly acidic pH caused by acne, but if you use too much, it can have such side effects. You can save money and avoid harmful chemicals in store bought products by applying baking soda to acne in the proper way and amount. But don’t use it too frequently, or the good effects of baking soda will disappear and leave you disappointed.